Before you call an interior designer, there are several simple things that you can do to streamline the process. The right interior designer is like a serenely patient mom or dad who listens to your wants, needs, and dreams - and then helps you bring them to life in a cost-, time-, and comfort-efficient manner. If you're ready to take the plunge and hire a professional to decorate your home, the process will be smoother and more enjoyable if you're prepared to explain what you like and want. These tips for selecting and working with an interior designer can help make the process smoother and more enjoyable. Before you pick up the telephone, here are several simple things that you can do to streamline the process. Start a home file. Create a list of your personal likes and dislikes in home decor. Do you enjoy the relaxed feeling of contemporary furnishings and found objects, or do you prefer the polished, ornate elegance of rich Victorian colors and fabrics? Jot down what works for you - and what doesn't. A clear list that your interior designer can refer to while shopping for you will help him or her bring back furniture pictures, color palettes, and fabric swatches that will be an appropriate match for you and your home - the first time around. Does your living room have to double as a family room? Do the kids need a place to do homework in the kitchen? Let your interior designer know all the activities that will go on inside the rooms you are decorating. A good designer can help you create the space for it all, beautifully. Flip through a few home design magazines and tear out the pages with photographs that catch your eye. You don't have to want everything inside the room - including the colors and fabrics - but if the overall feel of the room works for you, have it ready to show the designer. Conversely, if you happen upon a room that just leaves you cold, tear out that page to show to the designer, too. This information will tell him or her what you don't want to see, which will save time and effort for both of you. If you want to do your whole house - or even one room - in phases, be sure to let the designer know that at the start. You don't have to do it all, or spend your entire design budget, in a few short weeks. Spread the design process out over months or even years so you and your designer can take advantage of liquidations and seasonal sales - and help you get more for less. Conversely, if you need to have that remodeled kitchen or bathroom beautiful and operational in time for the holidays or an important dinner party, let your designer know that as well. 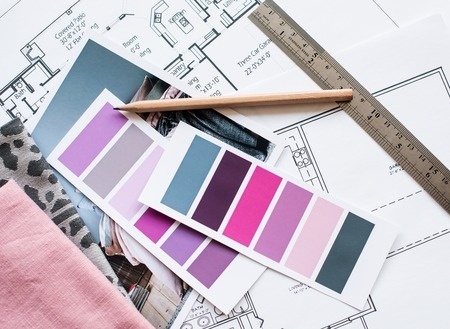 Know how much money you can comfortably spend, and make sure your designer knows, too. A good designer will work within your guidelines - and let you know if your plans or your budget need adjusting. Or visit an interior design association for references. A good place to start is at the American Society of Interior Designers. You should interview at least three designers, take a close look at each one's portfolio, and call former clients before you sign on the dotted line. During each interview, gauge just how well you and she communicate. Choose the interior designer with whom you are most comfortable and whose style best suits your ideas.